If you are looking for a smart and stylish black leather briefcase that doesn’t cost the world, then you might want to take a look at the Kenneth Cole Reaction A Brief History bag. It’s featured at the number 12 spot on our Top 15 Leather Briefcases, and it’s a popular seller that’s designed for professionals. 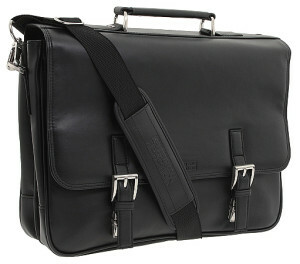 Find out in my review how well this compares with other briefcases and if it’s as good as it looks. One of the smaller briefcases around. Very soft-cover leather adds comfortability. Not as expensive as most other leather briefcases. Clasps underneath the buckles can be a bit difficult to unlock. Not ideal for carrying heavy loads. Dimensions (inches) 16" x 11.5" x 5"
There is nothing too fancy about the appearance of the “A Brief History” leather briefcase by Kenneth Cole. But that’s a good thing, because the attraction is in its simplicity. It takes on a rectangular shape with curved bottom edges. The top grain leather exterior is very soft and feels good, which makes it comfortable to put on your lap. Probably the first thing you’ve noticed is its belt buckles. It may have even drawn you to consider purchasing this briefcase. Those belt buckles that look like they’re holding the flap down are purely cosmetic, meaning that they’re not real. The flap is actually secured by clasps that are underneath the belt buckles. Some users have complained that the clasps are a bit fidgety to unlock, especially if you have large fingers and thumbs. 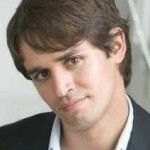 Also, over time, the ends of the leather straps for the belt buckle may curl upwards as it has done for several users. The stitching is tight and the metal hardware is fairly solid and thick. Although this is the case, there has been some reports by a few users that the clasp for one end that attaches the shoulder strap is prone to unclip itself sometimes. This is worrying if you carry a laptop or tablet inside as the bag can fall and get damaged. It’s also not advisable to overload the bag as the leather straps that holds the “D” rings for the shoulder strap can come apart if there’s too much pressure. 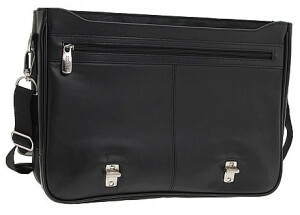 The Kenneth Cole Reaction “A Brief History” Leather Briefcase is smaller than most other conventional sized briefcases, and has a soft leather exterior. Since the Kenneth Cole Reaction A Brief History briefcase is not a particular large bag, there isn’t a lot of space inside, so if you’re looking for space, you should go for a larger briefcase such as the Samsonite Leather Expandable. With that being said, if you only have a few slim folders and accessories, this will be ideal. On the exterior, there’s a large open compartment which is great for storing items that you quickly need access to. The interior is lined with a sleek and shiny material that has Kenneth Cole Reaction logos over it. The compartments are simple, as there are only two large main compartments with the front one having several pen and card holders stitched to the divider. 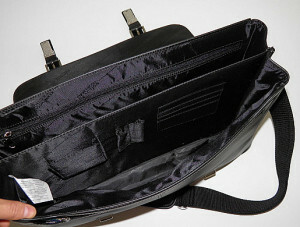 At the front and back of the inside, there are also two zipper compartments that are slim and useful for non-bulky items. Unfortunately, there is no padding anywhere inside, so if you’re carrying a laptop (fits up to 15.4”), you do so at your own risk. If you’re a simple person that doesn’t have to carry much belongings around, and you’re looking for a simple briefcase that looks professional, then the Kenneth Cole Reaction A Brief History leather briefcase fits that description. However, if you’re after a leather briefcase that’s more durable, higher quality and arguably more aesthetically pleasing, then you should check out the Kenneth Cole Show Business instead.